A coalition of about 60 students participated in a protest on Friday demanding that the University pay all of its workers, including student employees, a “living wage” of $15 an hour. The protesters gathered outside Regenstein Library before marching across the quad to Levi Hall, where they took the protest to an administrative lobby on the fifth floor outside of Provost Eric D. Isaacs’s office. 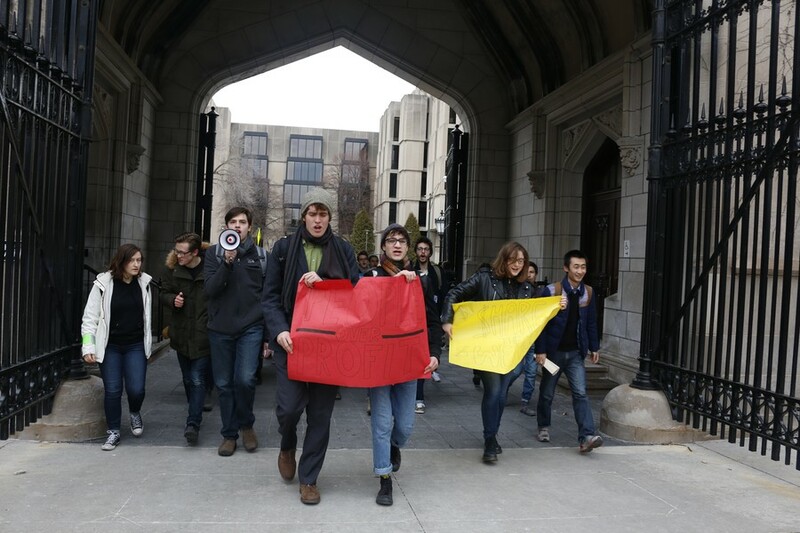 Fair Budget UChicago, a student organization that seeks to combat racial and economic injustice, hoped to deliver a petition, which has collected over 1,000 signatures, demanding a higher wage for University employees to Isaacs, but he was not in his office. One student asked for a commitment from the Dean-on-Call to deliver the petition to Isaacs. The Dean-on-Call, who declined to identify herself by name to The Maroon, told the protesters who had moved outside of Levi Hall after about 20 minutes that she could not promise the petition would get to Isaacs. Protesters booed at the dean when she said she didn’t have the authority to ensure that Isaacs would see the petition, and several other students shouted “do your job.” She did later say that she would make an effort to get the petition delivered. “Obviously this bureaucracy is not equipped to deal with such complexities as the delivery of a letter, so we will be back,” second-year member Elijah Wolter said over a megaphone. University spokesman Jeremy Manier confirmed in an e-mail to The Maroon on Monday that the Provost has received the petition. The protest was kept secret and off social media prior to the time of action in order to delay a police presence, according to first-year Gabby Thomas, an organizer of the protest. In the past, University of Chicago Police Department (UCPD) officers have locked the doors protesters use to enter Levi Hall, Thomas said. “Typically either the [UCPD] will bar the doors [to Levi Hall] and won’t let us in or they will remove us from the building. Typically it’s just by telling us to leave or we’ll be arrested or fined…. We were told to leave, but we weren’t told to leave with a threat of arrest,” she said. Fourth-year organizer Spencer McAvoy said that shortly after the protesters entered Levi Hall, three police officers entered the room and asked them to leave. As the protesters rushed up the stairs of Levi Hall toward the provost’s office, several organizers stayed behind to unravel a 45-foot scroll displaying the signatures on their petition for a higher minimum campus wage. Inside Levi Hall, Fair Budget UChicago leaders as well as a representative from Graduate Students United (GSU), an organization that works to increase wages and benefits for TAs and RAs, spoke about their experiences working low-paying jobs as full-time students and their demands for higher wages for University workers. Before learning that the provost was not in his office, protestors tried to shout their messages at him with a megaphone through the walls separating the lobby and the administrative offices. “We all deserve the right to a full, good education and you guys should not have to put your education aside just to eat on the weekends or be able to pay for your books. And moreover, the workers who clean the building, who paint everything, who make everything run—they’re struggling too, and [the University] keep[s] saying there isn’t money. There is always money,” GSU member Trish Kahle said. After the protesters learned that Isaacs was not in his office, they began to chant: “We’ll be back. We’ll be back. We’ll be back.” Thomas said she wasn’t sure whether Isaacs was out of the office on Friday in anticipation of the protest, but the protesters seized on the opportunity to criticize him for his absence. “Provost Isaacs is not at his job today, but we have a letter that we are trying to leave with the Dean-on-Call, but they cannot be found either…hopefully, Isaacs will be here at some point in time to do his job,” Wolter said. Students faulted the University for paying high salaries to administrators and for spending money on new academic buildings and dormitories before raising wages for campus workers. “Even as it spends billions of dollars remodeling its campus, and raises billions more in capital campaigns, the University of Chicago continues to pay hundreds of its workers, including many students, poverty wages. At the same time, this school has distributed $7.6 million dollars to just eight top administrators in the last five years. Clearly the University, one of the richest in the country, can afford to pay its workers a living wage,” reads the Fair Budget UChicago petition. Wolter said that the group will continue its fight with the University until it agrees to meet with the coalition of students and recognize their demand for higher wages. “Clearly there is public support for what we are doing. There is public need for what we are doing, but the administration doesn’t listen to all these people. They listen to each other, and they listen to the Board of Trustees. We are just not going to allow them to continue to ignore the needs of the people who constitute the workforce of this University,” Wolter said. Second-year organizer Hanna Gregor said that they protested outside the provost’s office in Levi Hall in the hope that he would agree to meet with them about their demands. She said that Isaacs has not agreed to meet with the organization in the past, but she remains hopeful that he will respond to the petition they gave the Dean-on-Call. “What happens to student workers when tuition increases by 4 percent, but student wages remain constant?” Gregor said in a press release last Friday. According to Manier, the provost took questions from Fair Budget UChicago on November 2, 2015 at a Student Government Assembly. The University has encouraged the organization to continue to use that forum to discuss campus wages with the provost, he said. “Since the topics that this student group is raising are of interest to a broad range of students, University representatives have encouraged them to request engagement through the Student Government Assembly—a venue that is, in our experience, effective for student engagement with University leaders and administrators,” he said. Manier added that the University does not enforce a minimum wage on its “hiring units,” but rather enforces the minimum wage set by legislative bodies like Chicago’s City Council. Student organizer Juhi Gupta said Fair Budget UChicago is pushing for a $15-an-hour wage because it is “widely acknowledged” as the minimum wage to support a “decent” and “healthy” life. The organization has also been influenced by the Fight for $15 movement, a nationwide campaign for higher wages, she said. Fair Budget UChicago indirectly canvasses for presidential candidate Bernie Sanders, who has advocated for a $15-an-hour minimum wage, under its umbrella organization Southside Solidarity Network, which works with Reclaim Chicago to canvass for Sanders. According to Gupta, while Fair Budget UChicago does not officially endorse Sanders and members are not required to canvass for him, most members support the Senator, who taped Hardball with Chris Matthews in the Quadrangle Club the evening before the protest. Democratic presidential candidates Hillary Clinton, who supports a $12-an-hour federal minimum wage, and Bernie Sanders have both expressed support for raising the national minimum wage, which currently stands at $7.25 an hour (Chicago's minimum wage is $10 an hour, and scheduled to rise over the next few years). Republican frontrunners Donald Trump, Marco Rubio, and Ted Cruz have publicly opposed raising the minimum wage.